Photo by Roger Kirby, via Free Images. Want a romantic wedding? You can get it naturally with a wedding on the beach or near the waterfront on Long Island. Saying ‘I do’ while the sun sets over the ocean and the waves crash against the white sandy beaches is the most picturesque view any bride would desire. Just miles from New York City, Long Island offers some of the world’s most pristine and beautiful beaches as well as mansions and historic places near the waterfront to host the special day! Whether it is a casual sand-in-your-toes ceremony with the ocean as your backdrop, in a beachside pavilion or garden, or an elegant formal venue in a historic mansion near the waterfront, your choices are limitless on Long Island. Between the many state park beaches, gardens, mansion, and other historic places sitting near the waterfront, you’re sure to get a spectacular view on your wedding day! 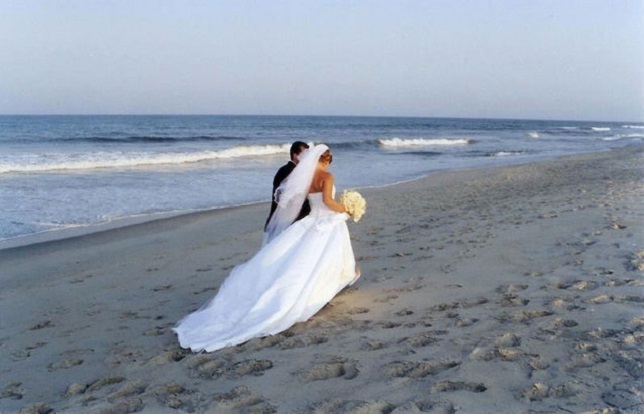 Many of the state parks on Long Island have beautiful beaches and welcome wedding ceremonies and photography. Typically there’s also exclusive catering service vendors to work with so that there’s one less thing to have to research when it comes to planning a wedding at the beach. State parks do require a permit for special event use and if you’re planning to rent a covered pavilion, it's available on first come, first serve basis. All the information you need for a park permit, covered pavilion rental, and recommended catering vendors are available here. View of Fire Island Lighthouse. Photo by Erica Mengouchain, via LongIsland.com. Wedding ceremonies are permitted on the terrace of the Keeper’s Quarters. If you are looking to host a reception, then off-site options are available. 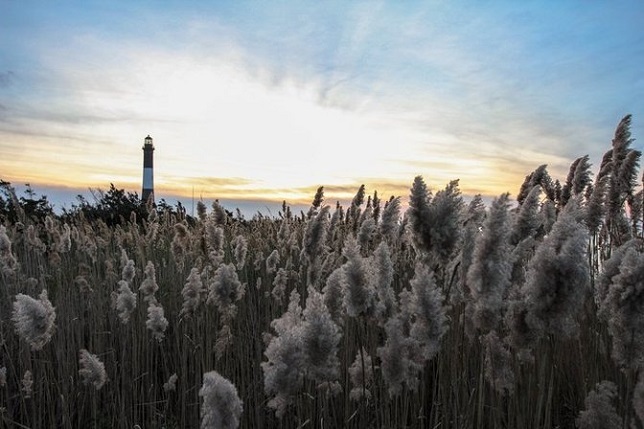 A wedding at the Fire Island Lighthouse allows you to enjoy the natural beauty on land that has a unique maritime history. The lighthouse is made up of 182 steps and at the top is a magnificent view of the ocean, Fire Island, the bays and even the New York City skyline on a clear day. Robert Moses State Park also offers five miles of ocean beach. Located on the shore of the Great South Bay, the park offers a beach, picnic tables with pavilions, and scenic views to set the stage for a natural, romantic wedding. Have the Great South Bay and Fire Island as the backdrop. The park is 1,600 acres large and the parks shady picnic groves are perfect for group gatherings. The park is easily accessible from the Southern State Parkway. A historic hand carved wooden carousel, a shaded picnic area, and a view of Hempstead Lake, the largest lake in Nassau County are just some of the features to enjoy when hosting a wedding here. The Carousel party-room goes for $350 (as of 2016) for a three hour event and guests get to enjoy unlimited carousel rides. The sandy ocean beach at Hither Hills State Park includes unique “walking dunes” of Napeague Harbor on the eastern boundary of the park. The park is also complete with woodlands filled with Russian olives, oak, shad and pine trees, as well as bridle paths and hiking trails that allow for beautiful wedding photo opportunities. Couple on the beach after exchanging vows. Photo by Roger Kirby, via Free Images. It’s a popular destination for the summer beach goers, but it also offers a beautiful backdrop for a romantic wedding. Set your wedding under a natural environment with the oceanfront view and 2,400-acres of maritime environment. The beach park is accessible by car, boat, bike, and seasonal buses. Located on the easternmost point on the south fork of Long Island and New York State, it is where the famous historic Lighthouse commissioned by George Washington stands. The lighthouse dates back to 1792. Montauk Point State Park also offers a stunning view of the Atlantic Ocean and Block Island in the distance. Montauk is also easily accessible by many transportation means and small planes. The shorefront on Gardiner’s Bay is a popular destination for bird watching, but it also attracts couples seeking to host a wedding. Located on the eastern tip of the north fork of Long Island it offers a natural wonderland of waterfront. It’s also designated as a National Natural Landmark. With three miles of waterfront on the Long Island Sound and beautiful views, it’s no wonder it is a popular destination to host weddings. Offering natural attractions, a white sand beach, North Shore cliffs, and migratory birds available for view throughout the year, you can’t go wrong with this destination for your wedding backdrop. 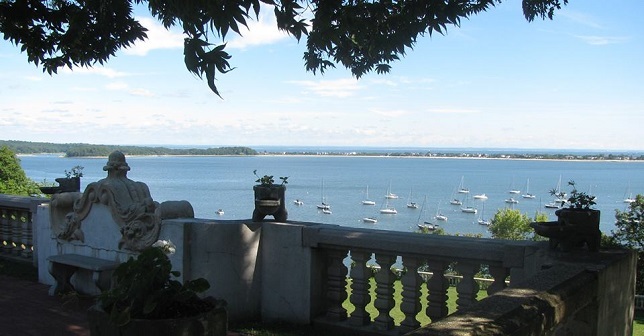 A view of the water doesn’t just happen at park beaches, many mansions and historic places on Long Island also offer a romantic setting under natural scenery with a view of the water. Some may be just steps away from the waterfront while others have well-kept grounds complete with gardens, lawns, ponds, and other natural elements to make for a beautiful and romantic wedding. 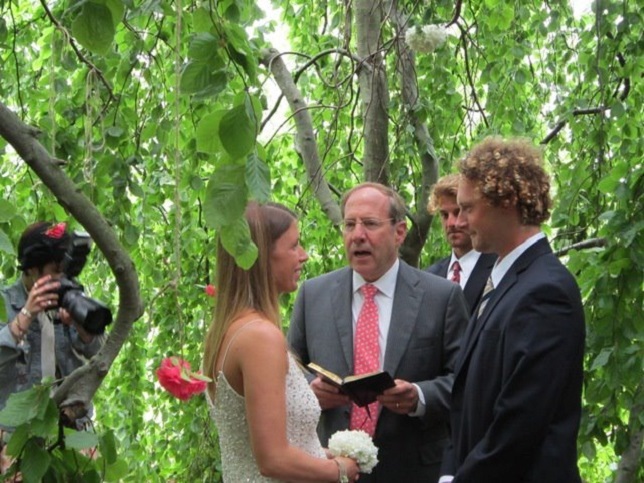 Wedding at Bayard Cutting Arboretum - Graham Eickelberg marries love of his life Cara under the Weeping Beech on the Great Lawn. Photo from Bayard Cutting Arboretum, via Facebook. Here you’ll find an oasis of outdoor beauty at its best. In addition to extensive plantings, ponds and streamlets, and small wildlife, there’s the manor house that overlooks the Connetquot River. Heckscher State Park adjoins the Arboretum, so if you’re not utilizing the picnic pavilion area there, the Arboretum does allow outdoor wedding ceremonies to be held on its grounds with a park permit that may be obtain onsite or from Belmont Lake State Park at the permit office. 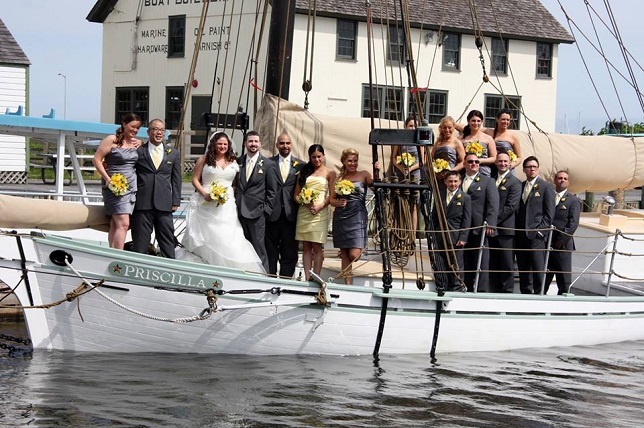 Wedding at the Long Island Maritime Museum. Photo from Long Island Maritime Museum, via Facebook. A wedding at the Long Island Maritime Museum offers a tranquil waterfront view overlooking the beautiful Great South Bay. This is a place with rich nautical heritage and it offers couples a warm and casual elegant environment. The property is set on a 14-acre campus between several historic buildings offering spectacular sunset views. Plan a wedding here means you’ll have access to beautiful grounds that allow for a romantic setting under the natural beauty of the park. Wedding photography is permitted by obtaining a permit. The locations offers options of an outdoor wedding ceremony at the Dahlia Garden and Haybarn or an indoor wedding ceremony at Coe Hall Museum in the Great Hall (no receptions permitted). Plan your wedding at this historic venue were there’s the Hempstead House, known as Castle Gould. Here you’ll get a stunning, castle-like wedding venue that is just steps from the Long Island Sound. Falaise is also located here – the cliff-side waterfront home of Harry Guggenheim that can be rented with proper permits. View from the terrace of the Vanderbilt Mansion. Photo from Suffolk County Vanderbilt Museum and Planetarium, via Facebook. The mansion and natural history museum sits on grounds overlooking the Long Island Sound. Couples looking to host a wedding have many options at this location: an outdoor wedding on the lawn in front of the Vanderbilt Marine Museum, which overlooks the estate and Northport Bay; in the Courtyard; a tent on the side lawn; the Charles and Helen Reichert Planetarium lobby; the Rose Garden; the Lancaster Room; Moroccan Court; at the Wishing Well Garden and other options depending on your party size. With the beautiful view and many options, many requests come in so it’s recommended to book early. Check Out: LongIsland.com's Wedding Page! Know of any other beach or waterfront wedding destination points on Long Island?